What do you need to know about FAA’s new Reauthorization referred to as H.R. 302 – Public Law 115-25? CMT aviation staff read the bill so you don’t have to! Check out the highlights below. Authorizes level funding of $3.35 billion from the Airport and Airway Trust Fund for the FAA’s Airport Improvement Program (AIP) account for each of the fiscal years 2018-2023. Authorizes FAA’s Facilities and Equipment program at $17.7 billion over five years, from $3.398 billion in Fiscal Year 2019 to $3.701 billion in Fiscal Year 2023. Authorizes more than $1 billion annually for fiscal years 2018-2023 for supplemental airport discretionary grants. Directs that half of these funds are made available for smaller airports. Provides a minimum annual entitlement of $600,000 for each airport with annual passenger enplanements between 8,000 and 10,000. Does not raise the cap on the $4.50 PFC. Allows hub airports to participate in the pilot program for PFC authorizations (currently limited to non-hub airports) and eliminates the required justifications for levying a PFC of $4.00 or $4.50. Requires US DOT to contract with an independent non-profit research organization to conduct a study assessing the infrastructure needs of airports and existing financial resources for commercial service airports and make recommendations on the actions needed to upgrade the national aviation infrastructure system. Authorizes the transfer of unused nonprimary entitlement (NPE) funds to an NPE set-aside in the FAA discretionary fund. The fund is to be used for other eligible projects at nonprimary airports. Makes general aviation airport construction or improvement projects subject to the coordinated and expedited environmental review process set forth in 49 U.S.C. 47171. Allows general aviation airports to permit the construction of exclusively recreational aircraft by private individuals in airport hangars without violating any grant assurances. Extends for fiscal years 2019 and 2020 authority for airports without a classified status listed in the National Plan of Integrated Airport Systems to continue receiving the non-primary entitlement funding they received from AIP in fiscal year 2013. Makes maintenance or rehabilitation projects considered necessary for safe operation at an airport eligible for DOT grants if each is listed as having an unclassified status under the most recent NPIAS. Authorizes the Essential Air Service Program (EAS) at the following levels: $155 million for fiscal year 2018; $158 million for fiscal year 2019; $161 million for fiscal year 2020; $165 million for fiscal year 2021; $168 million for fiscal year 2022; and $172 million for fiscal year 2023. Reauthorizes the Small Community Air Service Development Program (SCASDP) at $10 million in fiscal year 2018 through fiscal year 2023 and allows any airport that is a small-hub or smaller to apply for a grant under the program. Directs the Secretary to give special consideration to communities seeking SCASDP funding to restore scheduled air service that has been terminated. Lactation Rooms – Requires medium and large hub airports to maintain a lactation area for nursing mothers to feed their infants, as well as a baby changing table in one men’s and one women’s restroom in each passenger terminal building. The section also makes the construction or installation of a lactation area eligible for AIP funding at any commercial service airport. Security Cameras – Makes the installation of security cameras in public areas of an airport AIP eligible. Emergency Preparedness – Requires the FAA to consider the emergency preparedness needs of a community served by an airport when evaluating that airport’s master plan. Use of State Highway Specifications – Requires the FAA to accept state highway standards for non-primary airports serving small aircraft if the standards do not jeopardize safety or decrease the life of a runway. Drones – Makes it a crime to knowingly or recklessly operate an Unmanned Aircraft System (UAS) in a manner that interferes with or disrupts the operation of a manned aircraft or too close to a runway. Environmental Mitigation – Creates a new pilot program allowing up to six airports to use AIP grants for environmental mitigation. DOT is one of a handful of agencies not included in the spending bills that were passed before the end of the fiscal year. Instead, its funding was extended at current levels through December 7, 2018. Congressional leaders are hinting that the December funding deadline may become another showdown over funding for a border wall, which could escalate into another partial government shutdown. 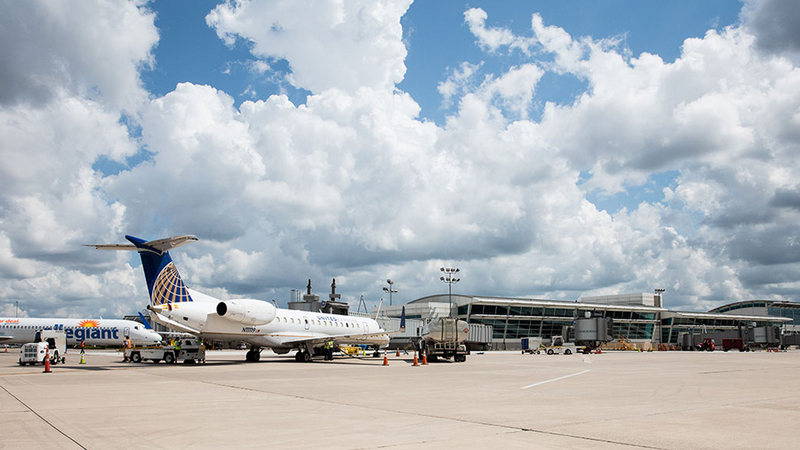 For over 70 years, CMT has been providing value-driven solutions and excellent customer experiences to airports. From vision to execution, airports benefit from a range of expertise in planning, engineering, architectural, environmental and technology, enriched by our steadfast dedication to their success.